Short back and sides, a beard trim and a thorough ear cleaning: there is little Hanoi's streetside barbers won't do. In the city where increasing numbers of Western salons cater to dapper urbanites with cash to spend, the city's old-school sidewalk coiffeurs still do a brisk trade thanks to loyal customers and $1.30 haircuts. 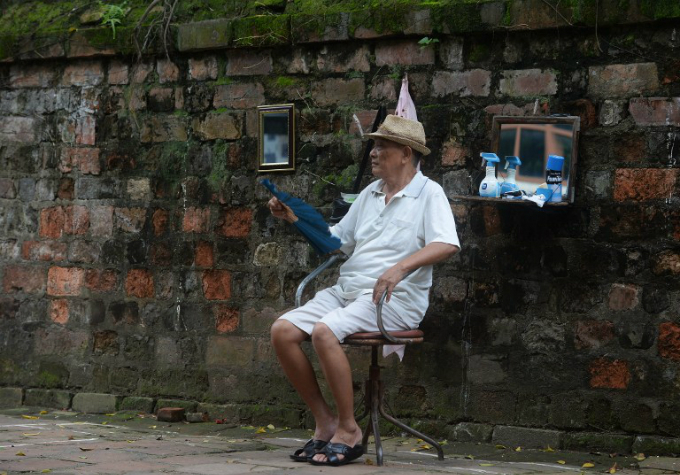 Across Hanoi, day or night, legions of entrepreneurial barbers like Nguyen Van Tu are hard at work snipping and shaving, often with little more than a few grooming tools and a small mirror, in Tu's case, hung up on a single rusty hook. "This job is relaxing. 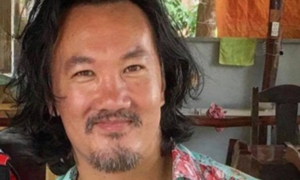 I work freely with an OK income, and I didn't have to invest (in the business)," said the 53-year-old barber, standing at his stall next to the weathered yellow wall of a primary school. 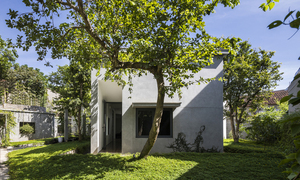 He relishes being his own boss and has even made a few friends along the way, like German designer Tobias Kuester-Campioni, a dedicated client since 2014. 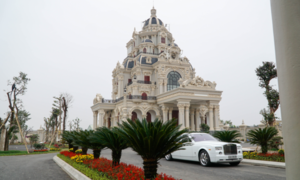 Tu used to work in a factory but switched professions a decade ago. Kuester-Campioni turns up at Tu's stall every 10 days, often bringing him new blades to add to his stockpile. 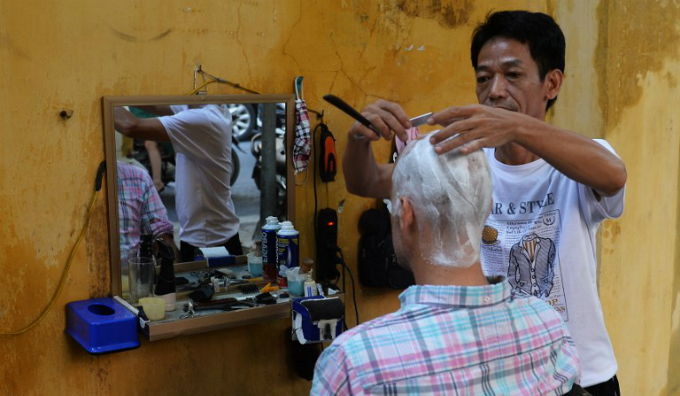 "It's a local tradition here in Hanoi, you see so many barbers on the street and I guess everybody has his own one and I found mine," he said, after being shorn clean with a fresh blade as motorbikes whizzed past. "I like the local taste, the local flavor." 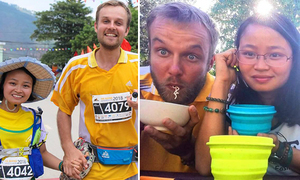 He said he's not shy about having his manscaping done in public view, a common sight in a city where so much daily activity happens in the street, from eating and cooking to child rearing and exercising. 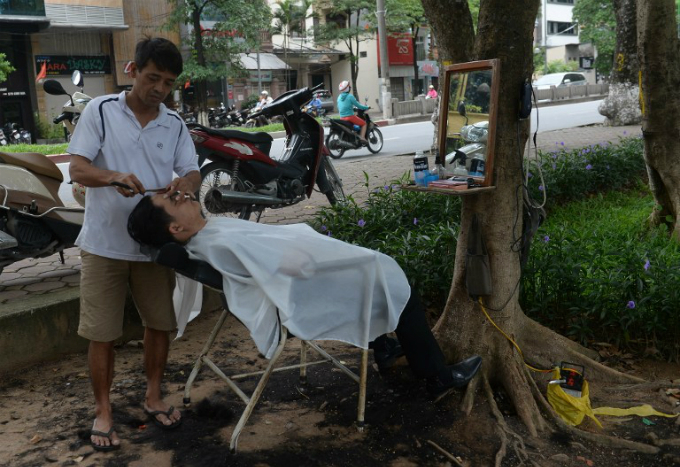 By some accounts, the tradition of cutting hair on Hanoi's sidewalks dates back generations, and today a haircut costs about $1.30, with a bit extra for an ear clean, still affordable to most people in Vietnam where the average annual income is around $2,100. The barbers have proven to have staying power, even as the formal hair care industry grows, with sales in the sector nearly doubling in value between 2010 and 2015 to $220 million, according to Euromonitor International. 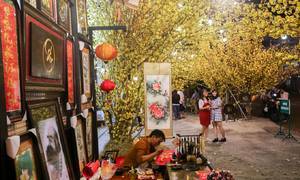 But the sidewalk barbers are so engrained that many prefer them to increasingly common Western-style salons which charge as much as $40 for a cut in the fast-developing communist capital of Vietnam where the middle class is burgeoning. 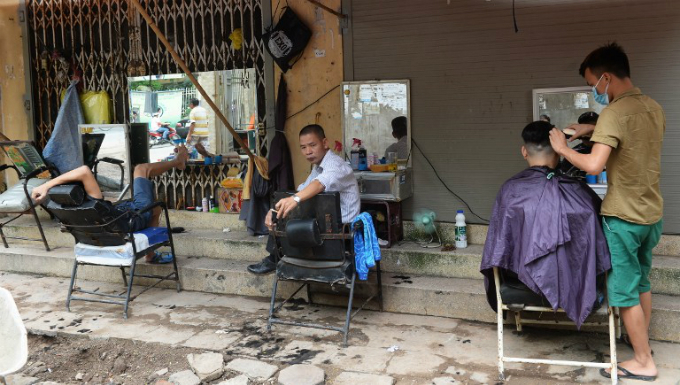 "I went to the salon for a haircut once or twice, but I felt uncomfortable there," said freshly-trimmed day laborer Ho Tien Dung. "I am in the street all day long, with dusty clothes, dirty hands and legs, so I don't feel comfortable entering the salon. Also cutting hair here is cheaper.